Regardless of your religious beliefs, you probably know that our city is home to many beautiful churches. These range from the historic gothic revival Christ Church (1853) on Capitol Square to the textbook modernist sanctuary of Holy Trinity Lutheran Church (1959) on Clark Ave. And there’s everything else in between. 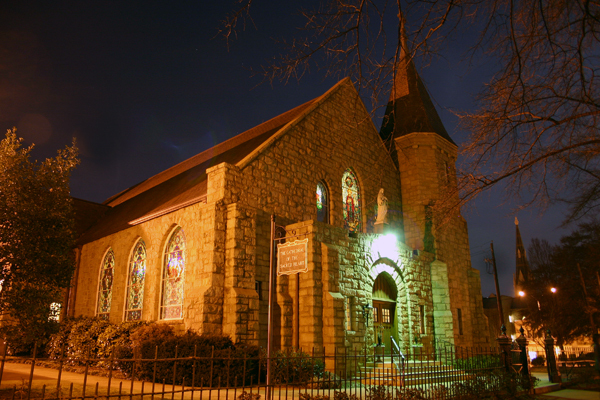 But one thing you probably don’t know is that Raleigh is also home to the smallest Roman Catholic Cathedral in the (48 contiguous) United States. 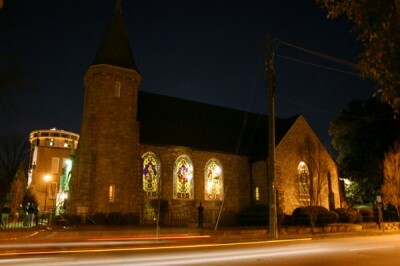 Sacred Heart Cathedral is situated downtown on Hillsboro St. at the corner of McDowell. The irony is that its status was never intended to be. There had been an organized Catholic presence in Raleigh since the 1820s, and a visiting priest ministered to the city’s tiny congregation until 1839. Sometime prior to 1860, a small, former Baptist church building on Capitol Square was secured for services. 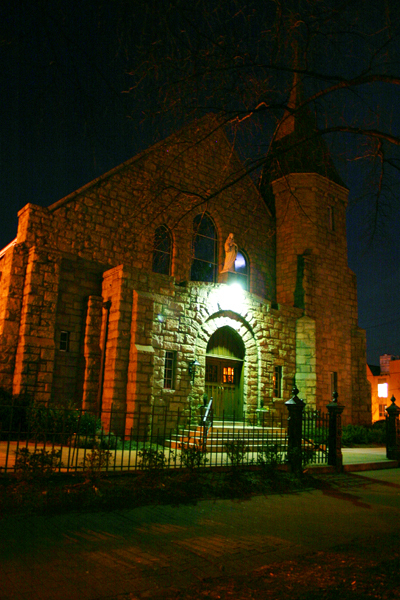 Raleigh’s Catholic population grew following the Civil War, and the inadequate space and poor condition of the building soon became an issue. For a time in the 1870s Mass was held in a meeting hall in the Briggs Hardware building on Fayetteville St.
Then, in 1879, Fr. James White purchased the former Brian Grimes homeplace (aka the Pulaski Cowper mansion) on Hillsboro St., and the parish of Sacred Heart Church was established. He expanded the mansion so that it could be better utilized as both as a church and rectory. Long-time pastor Fr. Griffin is buried on the grounds of the Cathedral. His gravesite is shown above. In 1899 Fr. Thomas Griffin was appointed pastor, a position he held for 31 years. During his tenure a parochial school was established in 1909, and the church campus was later expanded with the addition of a rectory and convent. 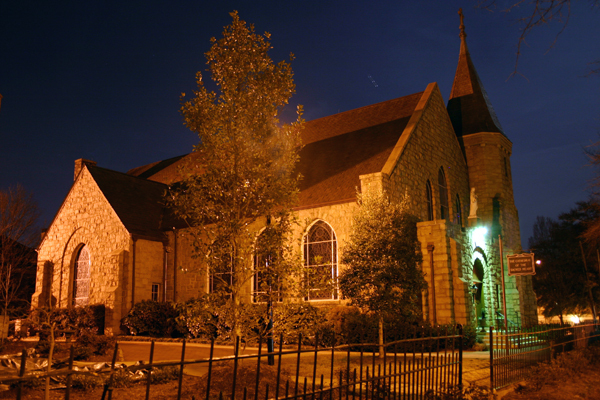 In 1922 the cornerstone of Sacred Heart Church was laid, and the French Gothic Revival stone building was dedicated in October of 1924. However, as these cities were at opposite ends of the state, Rome decided the seat, or cathedra, of the bishop of the new diocese should be in a more central location — so Raleigh, instead, was chosen. 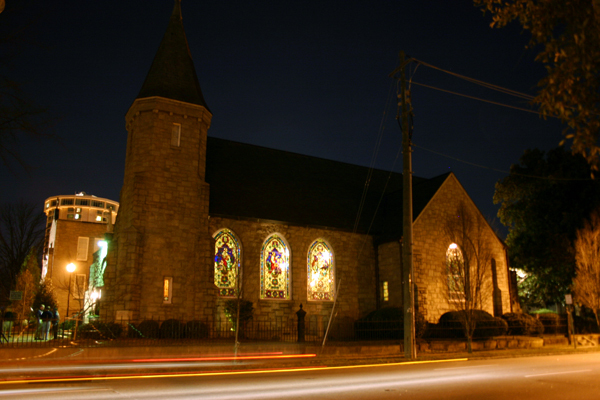 Thus, in December 1924, a mere two months after Sacred Heart Church had been completed, it became Sacred Heart Cathedral, the seat of the newly created Diocese of Raleigh, with the Most Reverend William Hafey of Baltimore as its first Bishop. His authority as bishop extended over the entire state of North Carolina. Bishop Eugene McGuiness of Philadelphia succeeded Bishop Hafey in 1937. He thought that the modestly-appointed Sacred Heart should “look more like a cathedral,” so in 1939, the beautiful patterned terazzo floors and the magnificent stained glass windows we see today were installed. Marble altars and reredos rounded out his additions. The interior of Sacred Heart Cathedral has undergone several ‘renovations’ over the years, but in 1998 a senstive and artistic restoration took place. Further improvements made in the 10 years since then have returned the Cathedral interior to very near its 1939 appearance. Nowadays, the tiny cathedral, which seats barely 350, is the home church of more than 3,000 parishioners. 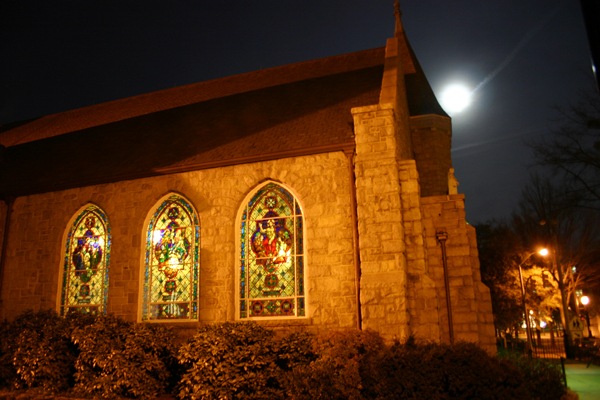 Sacred Heart Cathedral is a familiar Raleigh landmark, a precious jewel, really, and is beloved by all who worship there. 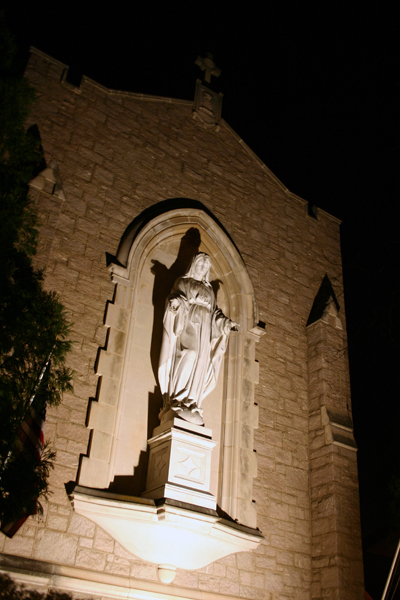 Our Lady watches over passersby on Hillsboro St. The 15-foot marble sculpture was placed here when a wing was added to the Cathedral School building in 1949. If you appreciate high ecclesiastical art, a visit to Sacred Heart Cathedral will be well worth your while. A good time to visit is after the weekday noon Mass. When you enter this sacred space, pause and reflect, as the quiet and intimate ambiance of the interior invites meditation, as well. The iron fence that surrounds the Cathedral has been there since the days the Grimes mansion stood on this site. 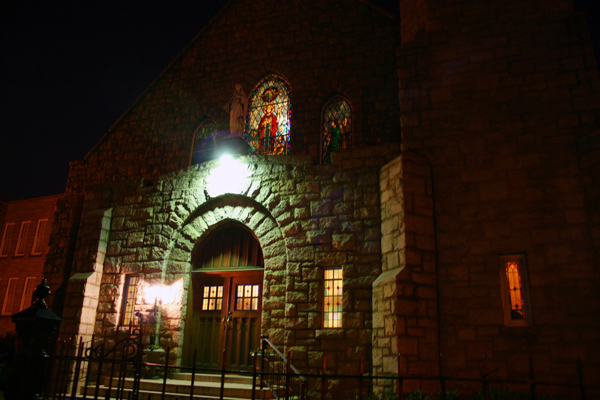 Author’s note: If you find the front doors locked (this is a downtown church, after all), walk around back to the private entrance for visitors, located in the west transept adjacent to the rectory. What an interesting article! I would have never known that Raleigh housed the smallest roman catholic cathedral in the nation. The pictures are quite stunning as well! Nureena — Thanks for the compliments. And you never know what you’ll read about on GNR! Glad you liked the story… and the photos…I have a good teacher! Sacred Heart is beautiful, and you did a great job capturing it. I wish you could shoot the inside at night. It’s packed with amazing and intricate detail. Eric — Thanks, man — I appreciate the comp. SHC is beautiful — inside and out. I especially love the sparkling gold stars on the blue ceiling — heavenly celestial. Would make for a unique ‘nighttime’ shot. The intricately stenciled detailing on the walls is mesmerizing. I love the way the stained glass windows cast their prismatic glow on the gleaming white marble figures of Mary and Joseph and the adoring angels. The deep blue and bright white stations of the cross evoke an image of Wedgewood pottery. It is all truly a visual and spiritual delight. Smallest Catholic cathedral in the U.S. or continental U.S.? Last I heard Holy Family Cathedral in Anchorage was the smallest in the 50 States. Msgr. Jerry Sherba, Rector of Sacred Heart Cathedral, has been fond of remarking that Sacred Heart Cathedral (“the mother church of the Diocese of Raleigh”) is the smallest Catholic cathedral in the continental U.S. I’m sure he’d be delighted to hear we have the distinct honor of being the absolutely *smallest* Catholic cathedral ANYWHERE in the entire U.S.
Dennis – OK then, we’ll just have to duke it out with Anchorage over the honor. Ours is by far the more beautiful though! And yes, I am a parishioner of SHC too! I really enjoyed reading this. I have been a parishioner at SHC for over two years now but I enjoyed reading more about its history that I did not know. I visited several parishes when moving to Raleigh but Sacred Heart was the only one I truly felt “at home” in. Brandon and Lanzki — Thanks for your comments! Yes, SHC is indeed a beautiful ecclesiatical space. Its restoration was the result of the efforts of former rectors Msgrs. Tim O’Connor and Jerry Sherba. 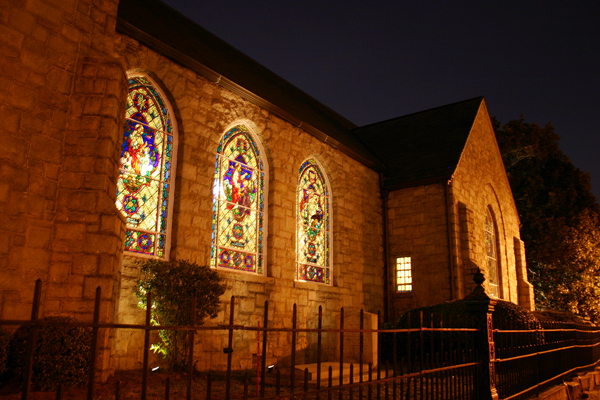 If you appreciate church art and architecture, be sure to visit nearby Church of the Good Shepherd, First Baptist and Christ Church. The interior of Christ Church is particularly awesome! Yes, I have been to both Christ Church and Good Shepherd (but not FBC) and both are very beautiful churches indeed. Truly beautiful and I would love to see the inside. If I get back to Raleigh in the future, I will make a point to visit. We are blessed with such beautiful churches with magnificent stained glass masterpieces. Wow! I never knew all this stuff about Sacred Heart Cathedral… to be honest I didn’t even know it was a real cathedral! Great article! And awesome pictures! Anyone know which church Msgr. Jery Sherba transfered to? Jon — Msgr. Sherba assumed office as the Chancellor and Judicial Vicar for the Diocese of Raleigh on 1 July 2009. http://www.dioceseofraleigh.org/offices/chancery/index.aspx The Very Reverend Daniel Oschwald was appointed as his replacement as rector of Sacred Heart Cathedral. Are there no photos of the interior of Sacred Heart Cathedral as it was in the early l980’s. Ahh, the memories. My second ex husband was married to a woman in a white dress in a Catholic ceremony at Sacred Heart Cathedral, soon after he was granted an annullment from me by the Catholic Diocese of Raleigh. Mary Ann Wheeler — I have seen photos of the interior of Sacred Heart following the 1970s ‘renovation’. These are not in my possession, but I can tell you the design was insipid and uninspired. I am grateful that the 1998 restoration brought the cathedral back to its original grandeur.